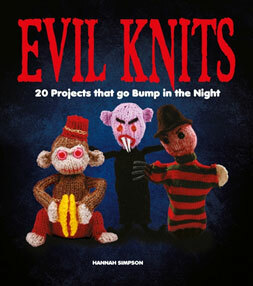 Evil Knits is a book of knitting patterns themed around Halloween and the supernatural, with many creative references to horror stories and films. Itâ€™s a bit more than just the patterns as it is aimed at being accessible for less than experienced knitters, so thereâ€™s a substantial introductory section which takes you through the basics and anything youâ€™ll need to know in order to tackle the patterns. Itâ€™s a great creative range of patterns â€“ I immediately received requests for some of the items from friends who spotted the book in my knitting basket. Simpson includes some innovative techniques and tools to achieve something a little different too: the LED light up ghosts are one example. I also felt that certain items would be transferrable as general toy presents for kids (without them needing to be â€˜Halloweenâ€™ gifts) â€“ the Abominable Snowman in particular could be done in different colours. However, I do have some criticisms â€“ nothing too harsh though: The book is touted as being accessible for beginners â€“ I started knitting about 18 months ago and would consider myself to be past the strictly beginner stage, but I donâ€™t feel that these patterns are pitched at beginner level. Some of them need concentration and practice, although this shouldnâ€™t put off beginners because, if youâ€™re prepared to work through the instructions and make a few mistakes, itâ€˜s a great way to pick up new techniques. A further possible issue is the range of different tools needed â€“ if youâ€™re a beginner you might want to go through the book and make a list of additional equipment and needles youâ€™ll need for each pattern you want to try; that way you can go out and buy them all and avoid getting halfway through to completion before you realise you need another size/type of needle to continue (ahemâ€¦). I also found it a little unusual that yarn types and amounts needed for each pattern are not specified. On the one hand, this can be freeing as you can use whatever yarn in your stash is of the weight suggested, (weight is the only detail referred to, e.g. double knitting, aran, etc.) However, beginner or not, it can be helpful to have an idea of the amount of yarn likely to be used, or a suggestion of a brand that works especially well with the pattern. Overall I think this is a great little book and is one from which Iâ€™ll certainly keep knitting â€“ after all I have all those requests to satisfy!